Useful dryer options such as Anti Static, Wrinkle Release and Line dry are handy for different fabric types. This freestanding dryer claims to dry clothes more quickly through the Moisture Sensor and Dry Sense technology, giving up to 35% energy-savings as a result. The NSF-certified Sanitize option keeps clothes from harmful elements by using very high heat. Essential programs like Normal and Delicates, for instance, are included in the unit's 13 dry cycles. 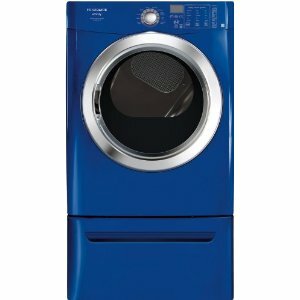 The dryer's 4 specialty cycles offer various settings suitable for special items like toys, pet beddings, and sports wear. A cycle that refreshes clothes without having to wash them with soap can also be used. Rubber-printed shirts and other heat-sensitive items can use a no-heat dryer setting called Air Fluff. This setting dries laundry without using heat. Very high temperature is used for the Sanitize option, a setting that kills bacteria and allergens while drying. The drum has a full capacity of 7.0 cubic feet, and can accommodate up to 8 lbs. of clothes during a Quick 25-minute cycle. It is made of stainless steel and fitted with a low-watt light. The buttons and dials on the unit's Express-Select control panel are clearly labeled to make program selection simple. An indicator screen is set next on the dryer's controls for easy monitoring of cycle time. The dial has an indicator light to show which program is selected. The dryer's reversible door sits exactly below the control panel. Made of sturdy transparent glass, the circular door is outlined with chrome trimming. Fabricated out of rust-proof stainless steel, the unit's cabinet is then coated with colored lacquer. Available colors are Classic Red, Classic Blue, Classic Silver and Classic White. A drawer pedestal and stacking kit are each sold separately. Depth with the door open: 51 7/16 in. The Express-Select controls are placed right in front of the unit for easy access. It has a no-heat drying cycle called Air Fluff. The Ready Steam technology releases steam for cleaner and fresher laundry. Quiet drying with the dryer's SilentDesign Ultra technology. The NSF-certified Sanitize option destroys bacteria and allergy-causing particles. The fully-stackable unit saves more space. The Time-Remaining indicator tells you the remaining time of a cycle. Wrinkles on clothes are virtually reduced with Wrinkle-Release option. The same features are offered on most of this unit's dry cycles, making the other programs worthless. The drum is smaller compared with other brands.